Finally something worth listening to coming from the Government. This is from the Internet Crime Complaint Center (IC3) which a joint office of the enforcement of the FBI and the outside non-enforcement of folks like the National White Collar Crime Center (NW3C). Do you visit websites by clicking on links within an email? Do you reply to emails from companies or persons you are not familiar with? Have you received packages to hold or ship to someone you met on the Internet? 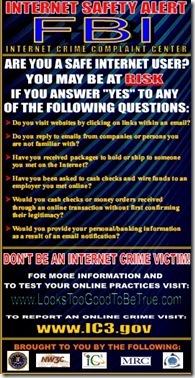 Have you been asked to cash checks and wire funds to an employer you met online? Would you cash checks or money orders received through an online transaction without first confirming their legitimacy? Would you provide your personal/banking information as a result of an email notification? This entry was posted on Thursday, June 4th, 2009 at 7:45 am and is filed under Technology. You can follow any responses to this entry through the RSS 2.0 feed. You can leave a response, or trackback from your own site.